A day after one House Committee proposed budgeting for tin foil hats to make a statement about opposition to Common Core Standards for public education, another House Committee will hear a proposal to bar the implementation of those standards in Missouri. 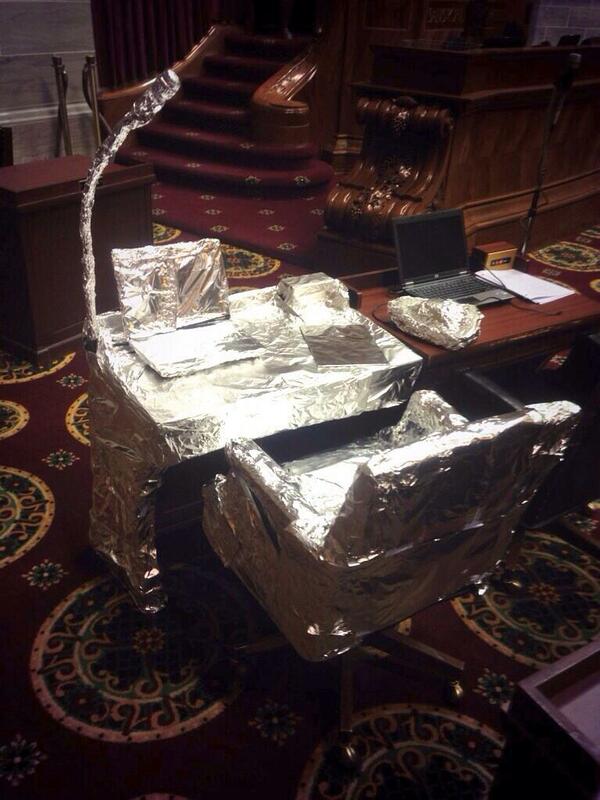 A picture circulating on Twitter late Wednesday night shows the desk of Representative Mike Lair (R-Chillicothe) in the Missouri House of Representatives’ Chamber covered in tinfoil. The provision was inserted by the committee’s chairman, Representative Mike Lair (R-Chillicothe), who intended it to suggest that some lawmakers’ opposition to the Common Core Standards is based on paranoia. Some opponents of Common Core tie it to things like the collecting of data on students and indoctrination of children. He noted legislation he filed that would limit the sharing of data and that would prevent the Department of Elementary and Secondary Education (DESE) from mandating curriculum or textbooks. The jibe may have earned Lair a measure of in-kind retribution. A photo circulated late Wednesday night on Twitter showed his desk in the House of Representatives’ Chamber covered in tin foil, along with his chair, laptop, voting box and microphone stand. The appropriation bill containing the $8 for tin foil goes to the full House Budget Committee for consideration. Thursday the House Committee on Elementary and Secondary Education is scheduled to hear a bill filed by Representative Kurt Bahr (R-St. Charles) that would prevent the State Board of Education from adopting and DESE from implementing Common Core State Standards. It would void all actions taken to adopt those standards after its effective date, August 28, and would make any statewide education standard subject to the approval of the General Assembly. That hearing is scheduled to begin 30 minutes after the House adjourns for the morning in House Hearing Room 3, in the Capitol basement. The House has strongly rejected a teacher evaluation bill that was a priority for the Majority Republican leadership. 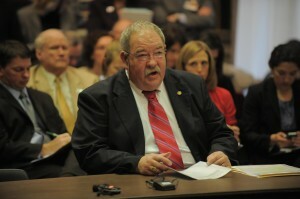 Representative Kevin Elmer (R-Nixa) sponsored the proposal that would have created a teacher evaluation system. The legislation would have tied teacher performance evaluations to student growth. More than 50 members of Elmer’s own party helped vote it down. 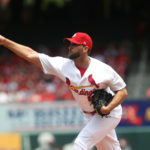 Representative Genise Montecillo (D-St. Louis) also voted against it. She says the state is already evaluating performance. Representative Mike Lair (R-Chillicothe), who chairs the House Appropriations Committee on Education, spoke against the bill on the floor. He said it reflects a concept that is a wrong approach to education. Following more than an hour-and-a-half of debate that wrapped up at almost midnight, the House failed to perfect the bill 55-102. The House has approved a bill to exempt most school districts in the state from prevailing wage law. Backers of the bill say many schools, particularly in rural parts of the state, have to put off construction and maintenance projects or leave them undone because they can’t afford to pay wages at the prevailing level. The sponsor, Representative Casey Guernsey (R-Bethany), says schools are having to pay significantly more for the same work that costs private businesses much less. He says this change will let projects proceed that have been put off or gone undone. Representative Mike Lair (R-Chillicothe) says to him the proposal is not a labor bill but an education bill. He says it would free up more money in school districts that right now has to go to construction projects. Democrats like Representative Michael Frame (D-Eureka) say the legislation is about labor and wages. Representative Mike Colona (D-St. Louis City) tells proponents their bill will hurt workers. The bill exempts school districts in counties that do not have a charter form of government from prevailing wage requirements. It now goes to the Senate. Two legislative committees have revisited a model of what could go into a higher education funding formula that would include performance-based funding. A presentation that was first offered to the Joint Committee on Education last month was given to the House Budget Committee on Education and the Senate Education Committee on Wednesday. The model is based on public hearings of the Joint Committee held last year, what education policy makers had to say, study of other states’ practices and reports and recommendations from more than two decades of earlier work by task forces, committees and commissions. 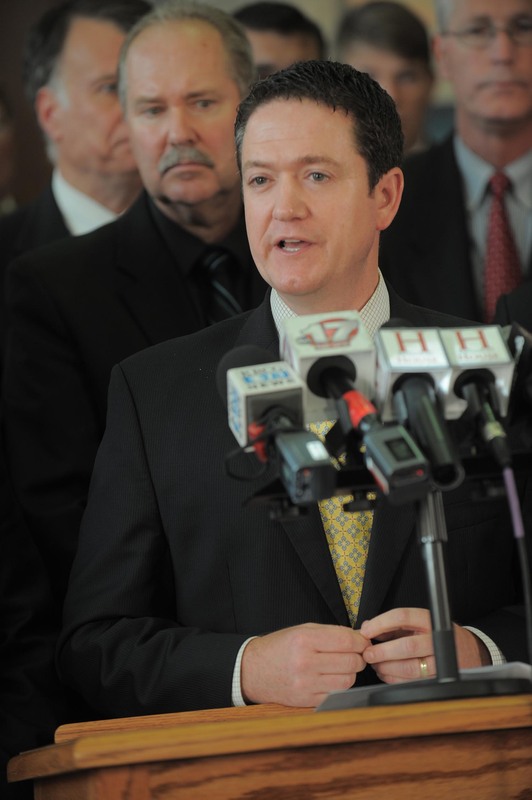 The model would have the state provide 35 percent of an institution’s operating costs. 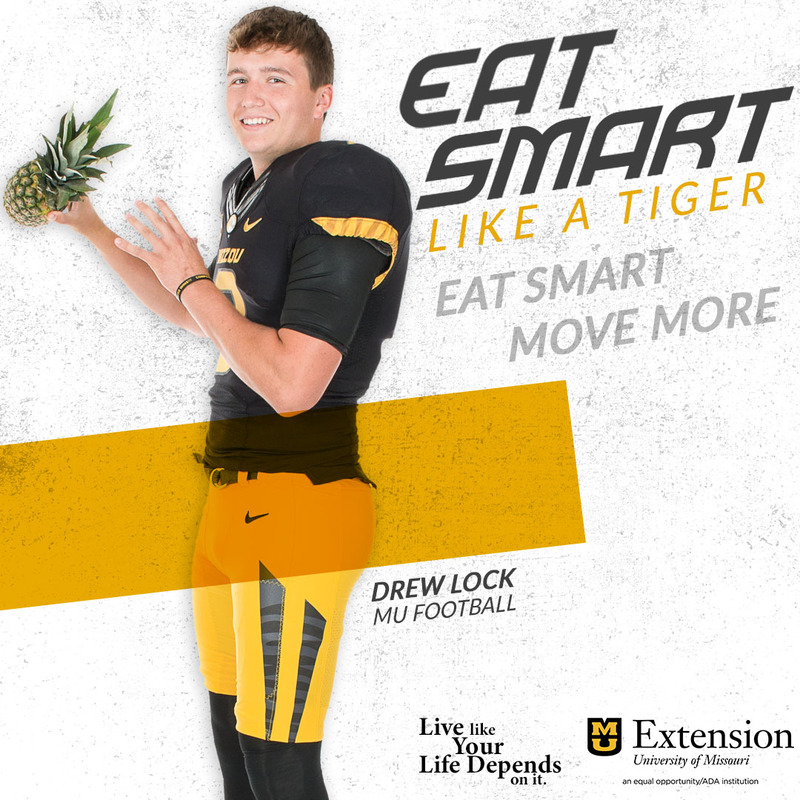 10 percent of that would be tied to performance in five criteria. 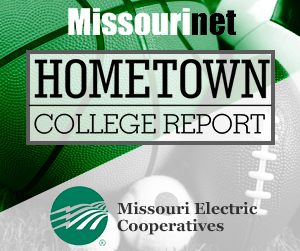 See the model proposal for higher education funding in Missouri (pdf). Joint Committee Chairman Senator David Pearce (R-Warrensburg) says people are anxious. Pearce says creation of that spreadsheet will begin next month. Representative Genise Montecillo (D-St. Louis) says she understands wanting to reward good outcomes, but she is worried about what the formula will mean for some community colleges. Joint Committee Executive Director Stacy Preis says one of the recommendations is the inclusion of a stop-loss provision. See what institutions said in reply to the funding model presented in December. Preis expects one of the debates in the creation of a formula will be whether that performance-based funding is a bonus on top of a base appropriation. Chairman of the House Budget Committee on Education, Representative Mike Lair (R-Chillicothe) says he doesn’t know which way he’s leaning on that debate yet. Lair says to have the proposal ready to employ in 2015, the legislature has to be developing it now. Legislation to let the state move faster to take over failing school districts is again up for legislative consideration. 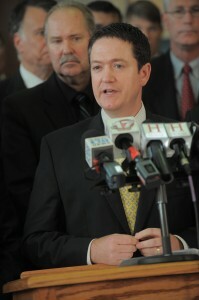 Representative Mike Lair’s legislation to allow DESE to move faster to take over school districts did not reach the Governor in 2012, despite unanimous support in the Senate and House. Last year Representative Mike Lair (R-Chillicothe) introduced a bill to allow the Department of Elementary and Secondary Education (DESE) to immediately take over a school district when it loses accreditation. The Senate wanted the House to finally pass that bill, the House wanted the Senate to finally pass a bill changing the criteria for the firing of teachers. Both proposals failed as the final minutes of the legislative session wound down despite earlier versions of Lair’s legislation receiving unanimous votes in both chambers. Lair says that was frustrating. 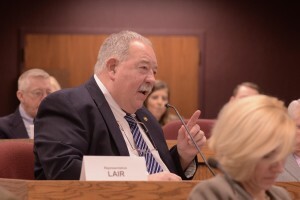 Lair’s bill in the 2013 session is HB 50. 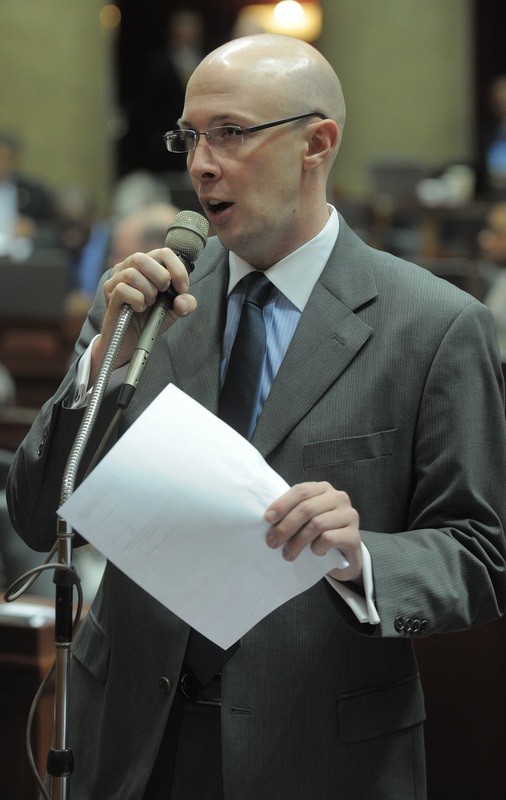 The likely next Speaker of the Missouri House wants to see a committee formed to work on education issues in the interim, after some key issues were left on the table in the 2012 session. Majority Floor Leader Tim Jones (R-Eureka) says compared to past years when education issues fizzled, the 2012 session was “remarkable” with several passing out of the House. Jones wants to keep that momentum going ahead of the 2013 session. Jones says the foundation formula for public school funding will be a key issue in 2013, but he also wants to see things like tuition tax credits and teacher tenure addressed. 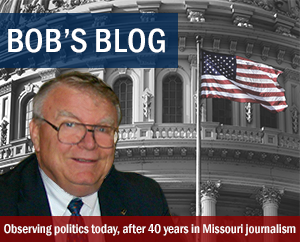 With many faces in the legislature changing, Jones isn’t sure who he wants to chair such an interim committee but he knows who he would want on it: Representatives Steve Cookson (R-Fairdealing), Mike Lair (R-Chillicothe), Mike Cierpiot (R-Lee’s Summit) and Rick Stream (R-Kirkwood) are some names he mentions.